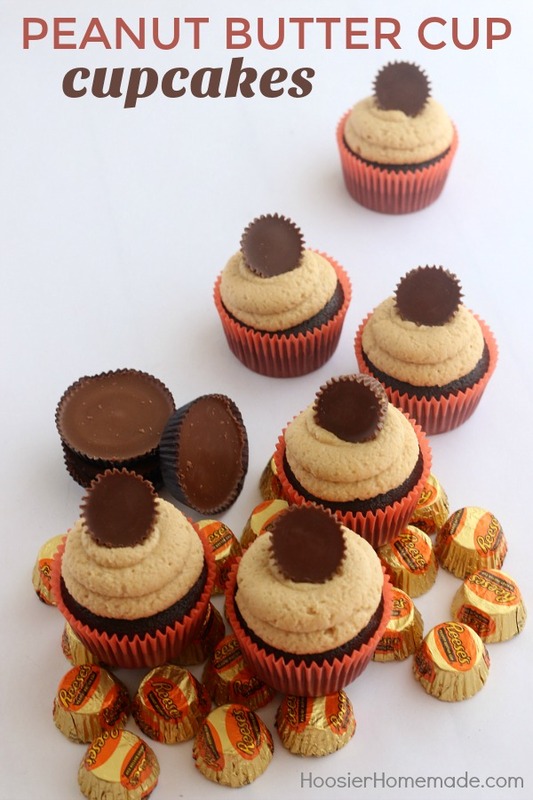 These Peanut Butter Cup Cupcakes were very easy but big on flavor and presentation. I used a Chocolate Cake recipe that I’ve never tried before, it was very dense but had good flavor. We had a house divided on them, Doug and my youngest, Casey, loved them, the other 2 boys and myself liked the flavor, but like a more light tasting cupcake. Man oh Man is the Peanut Butter Frosting yummy though. I could just eat it by the spoonful! But here’s the deal – you don’t have to use this recipe for Chocolate Cupcakes. Short on time? Use a box mix and add ingredients to make it taste homemade. There are many flavors of cupcakes that I adore. But when I bake Chocolate Cupcakes, they almost always go straight to the top of my favorite list. And when I add Peanut Butter, that’s even better. And we can’t forget the Peanut Butter Cups, I have yet to meet anyone that doesn’t love peanut butter cups. If you are looking to keep the color scheme, these orange cupcake liners are great- and don’t forget piping tips! Combining the flavors of chocolate and peanut butter, these Chocolate Peanut Butter Cupcakes from HoosierHomemade.com are melt-in-your-mouth delicious! In a separate bowl, combine cocoa, flour, baking powder and salt. Add dry ingredients, alternating with the sour cream, beginning and ending with the dry ingredients. Gently fold in Peanut Butter Cup pieces. Divide batter into cupcake liners. Bake for about 15 minutes or until a toothpick inserted in the center comes out clean. Recipe adapted from Baking Addiction. I’m a sucker for anything chocolate and peanut butter…my favorite flavor combination! 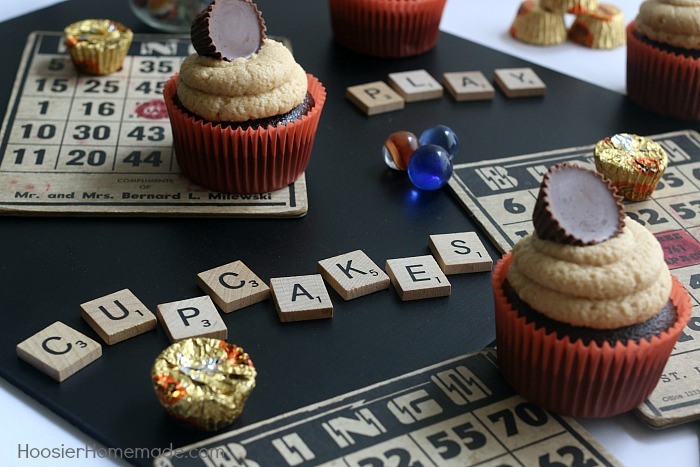 PB Cup Cupcakes are some of my favorite. I tried them a few months back, and dipped the peanut butter frosting in chocolate ganache that hardened, and then I died, and I never want to make another kind of cupcake again…ever! 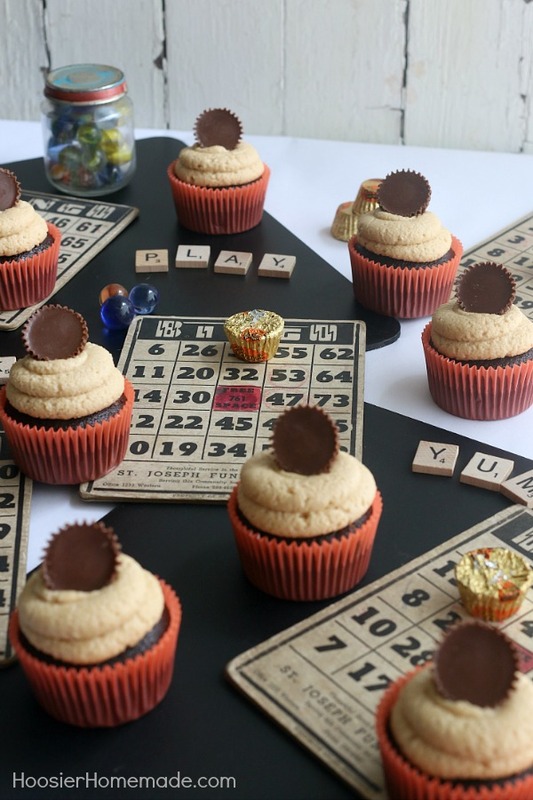 They look delicious, I love peanut butter cups! Oh MY! These look amazing! I can’t wait to try them! Your PB cupcakes look AWESOME! This is on my to do list tonight. Yummy! OH be still my heart. My favorite combo right there. I’m loving the presentation though. Just perfect! These look delicious! I hope you will join our link up tomorrow – No Whine Wednesday! I have some packages of peanut butter cups hanging out in the cupboard that would be the perfect size for these! I also recently made a cupcake recipe from David Lebovitz for a German chocolate cupcake and the chocolate cake was so light and yummy! Might work well for this recipe..I found it on his blog. Can’t wait to peek at all of the other cupcake creations. YUM! This was so much fun! 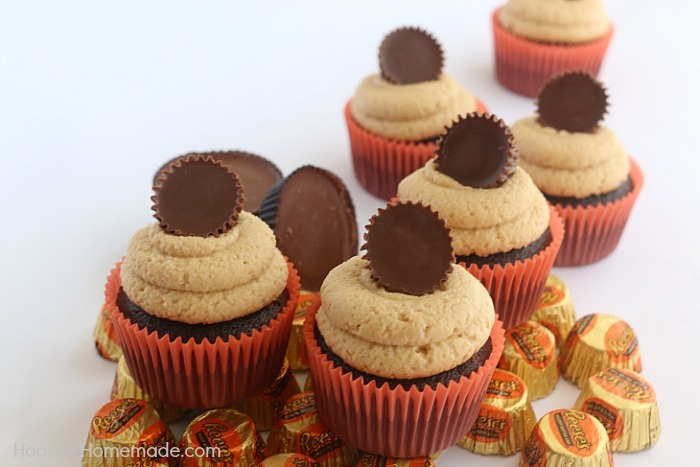 I love the peanut butter cupcakes, they look fantastic. I love chocolate cake with peanut butter icing, great idea adding the Reese’s Cup. Thanks for sharing. My favorite candy on my favorite dessert. What more could a girl ask for?